At her “tender years,” she of late went with a short-term mission team to South Africa to minister to career missionaries there, giving them a “break” It was a “breather” from their living their lives in another culture, with local lifestyles that are different, speaking some other language than their own. While there, she met Wycliffe Bible Translators Serge & Olivia Razafinjatoniary, natives of Madagascar, living in South Africa in conducting their intense ministry of translating the Bible into 40 languages of southern Africa. A wonderful and heartwarming article about Serge and Olivia with several terrific pictures can be accessed by clicking on https://www.wycliffe.net/articles?id=6127. And our understanding is that they cannot return to their great work until they have raised their financial support. Joan and I intend to get into the joy of helping. Will you join us? Janet Christian is a wonderful role model for seniors. She reminds us that older believers can be vital and productive in doing good things. Janet has lived as many years as Simeon and Anna (found in Luke 2:21 – 38). But these wonderful older people were chosen of God to greet baby Jesus in the Jerusalem temple when brought there by Mary and Joseph. So Simeon, Anna, Janet, myself, and so many others have and had a meaningful role in praising God and honoring Jesus, the Son of God, in older years! About Anna in the New Testament: a “prophetess” who was “…very old… She never left the temple, but worshiped night and day, fasting and praying. Coming up to [Mary, Joseph, and baby Jesus] she gave thanks to God and spoke about the child to all ...” (Luke 2:36 – 38). Select the amount and the way you want to donate. 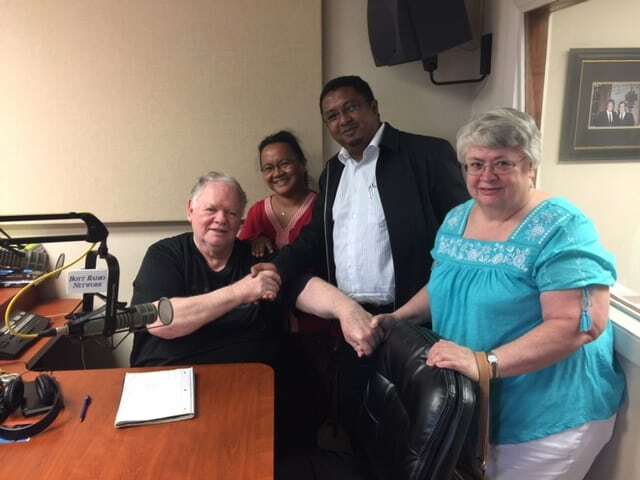 To hear … “Wycliffe Bible translators from Madagascar visit St. Louis, open to speak at your church or group (636-544-6423)” … click on … www.haroldhendrick.com/2018/06/05/wycliffe-bible-translators-from-madagascar-visit-st-louis-open-to-speak-at-your-church-or-group-636-544-6423/. Janet Christian will continue to be a good contact for Serge and Olivia… even after their visit to St. Louis. She can be reached at 636 544-6423.